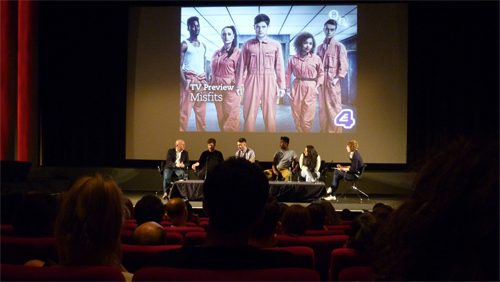 Last week I attended the Misfits S3 launch and screening at the BFI. I won't delve deeper into the premiere episode aside from saying that any concerns about the series' demise, with the departure of Nathan, were premature and assuaged by a breakout performance from Joseph Gilgun as Rudy. During the cast and creator Q&A that followed. Misfits' creator Howard Overman outlined that Superhoodie's identity was decided midway through recording S2 and alluded to a US version, after it was noted that Misfits has garnered a cult following, in North America, since Hulu started streaming S1. Josh Schwartz (The OC and Gossip Girl) confirmed that a Misfits remake will be produced by his company Fake Empire under Warner Bros. The combination of Howard Overman and the power of the Schwartz is too compelling to fail! The OC's Rachel Bilson should be cast as Alisha. What do you think? Misfits S3 starts on E4 Sunday, 30th October, at 10pm. Watch Misfits online at LOVEFiLM.com today, LOVEFiLM stream a huge collection of movies, also sign up now and get a 2 week trial absolutely free.